The word pastel is derived from pastello, Italian for paste. 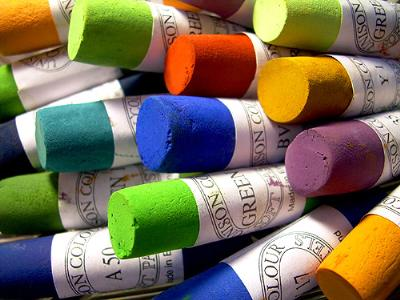 Chalk Pastels are made from finely ground pigment mixed with water and a small amount of glue, usually gum tragacanth. Pure colours are made lighter by adding white chalk called calcium carbonate. The finished paste is shaped into round or square sticks and allowed to harden. The softness or hardness of a pastel depends on the nature of the pigment and on how much binder is used, the more glue the harder the stick. Oil pastels are made by cooking raw pigments with an oil-soluble wax binder into a buttery paste, which is then moulded into crayons. 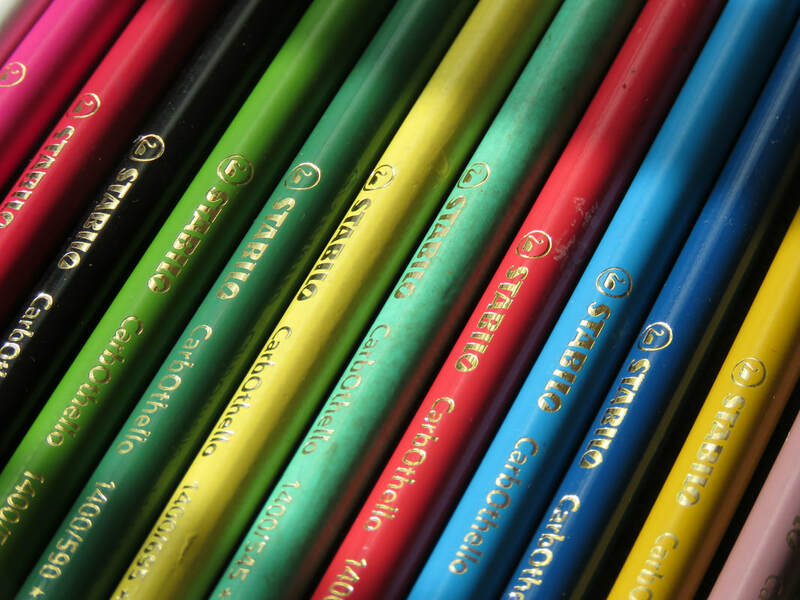 Pastels are very versatile; they can be used as both a drawing and a painting medium. By twisting and turning the pastel stick you can create several different effects – fine, precise lines; broad, sweeping strokes, and solid dense layers of colours – and these can be combined in an almost infinite number of ways. Pastels are quick and direct, have pure vivid colours and can be mixed with a variety of other drawing and painting mediums, for example: watercolour, acrylic and oil paints, pen and ink, monotype prints, pencils and ball point pen. An abrasive surface or ‘tooth’ is required as a ground for pastel to hold onto. The finer the tooth the quicker it fills, the rougher it is the more pigment it holds. There are many types of papers and supports that can be used including; velour, pastel, watercolour and sanded papers; canvas and museum mat boards. Pastel is an immediate, spontaneous and luscious medium to work with. It can be used in many exciting ways and, with proper care and attention, will never discolour or darken, crack or fade. In 1499 a French artist travelled to Milan taking with him brightly coloured sticks of dried pigment. In that same year Leonardo da Vinci created his portrait of the Duchess of Mantua, one of the oldest works in pastel that exists today. Drawn primarily in black and red chalk, it also has passages of yellow and brown pastel. He called the new technique ‘the dry colouring method’. Gaining popularity, pastels had their peak in the 18th century when a Venetian pastelist named Rosalba Carriera introduced the medium to Paris. In her first year there she completed 50 portraits. Pastel portraits became all the rage, with Maurice Quentin de La Tour becoming one of the most successful proponents. Later in the century Chardin created a new look for pastels, painting boldly with individual strokes of colour, a contrast to the soft, delicately blended style of other pastel painters. It was in the mid 19th century that pastels were first used in a truly expressive way. The Impressionists loved pastel for the brilliance of colour and the quick application. Edgar Degas was the most experimental, combining it with oil, gouache or monoprint, using it wet and dry, even steaming sections of the painting to create special textures. Mary Cassatt, a pupil and friend of Degas, was responsible for the introduction and popularity of pastel in America. French artists, such as Picasso, Redon and Vuillard, continued their love affair with pastels into the 20th century, until World War I brought a decline in its use worldwide. Since the end of World War II however, pastels have experienced a growing acceptance and popularity, largely through the efforts of the many pastel societies and groups.